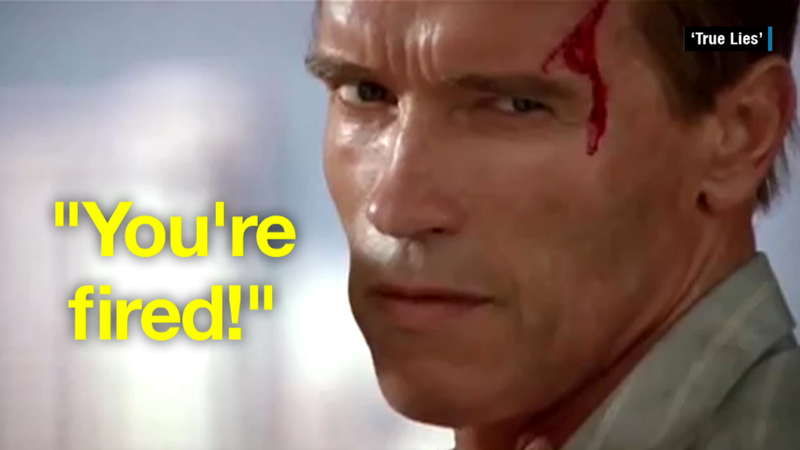 Instead of "you're fired," will "Celebrity Apprentice" contestants soon hear "you won't be back?" Arnold Schwarzenegger is replacing Donald Trump on "The Celebrity Apprentice," NBC's long-running business reality show, the network announced Monday. The former California governor is a world-famous movie star, known for films like the "Terminator" series, which generated his catch-phrases like "I'll be back" and "Hasta la vista, baby." He most recently starred in "Terminator Genisys" over the summer. Trump's famous "Apprentice" line is "you're fired," of course, so on Monday there were lots of guesses about what Schwarzenegger's farewell to contestants might be. But he has a while to come up with his own catch-phrase. His first season won't premiere until the fall of 2016 at the earliest. NBC put the "Apprentice" franchise on hold after Trump, the show's host since it launched in 2004, entered the Republican race for president. The network began casting for a new host right away but decided not to air it until the 2016-2017 television season, which starts in September 2016. On Twitter, Trump gave Schwarzenegger his blessing: "He'll be great & will raise lots of $ for charity." Congrats to my friend @Schwarzenegger who is doing next season's Celebrity Apprentice. He'll be great & will raise lots of $ for charity. "Arnold Schwarzenegger is the epitome of a global brand in entertainment and business, and his accomplishments in the political arena speak for themselves," Paul Telegdy, NBC's president for alternative and late night programming, said in a statement. "It was Arnold's personal passion for the format that Mark Burnett and Donald Trump built over the last decade, as well as his fresh take on how to take it to new heights for today's audiences, that made him the man to hire," Telegdy added. With Schwarzenegger, 68, NBC hopes to successfully restart a franchise that has seen better days. "Celebrity Apprentice" pits famous contestants against one another in business world challenges. Wow. I'm blown away and honored by all your tweets. I can't wait to bring my experience to the board room & raise millions for charity. The original version premiered in 2004 to an average audience of 20.7 million, but has dropped considerably over the years. Still, the franchise has been a workhorse for NBC, delivering millions of viewers for more than a dozen seasons. The show's most recent season, in January and February, averaged 7.6 million viewers. Trump has said the network "begged me" to stay out of the race so he could continue hosting. But once he did launch his campaign, NBC cut ties with Trump, partly due to the candidate's offensive remarks about Mexican immigrants. NBC also cancelled its airing of the Miss USA pageant, an event it jointly owned with Trump. Last week NBC sold its stake in the pageant organization to Trump. On Monday Trump agreed to sell Miss USA and Miss Universe to the talent agency and marketing firm WME-IMG. NBC and Trump appear to have buried any ill will. In Monday's announcement, network executives spoke warmly of Trump and his desire to see the show continue with a new host. On "The Celebrity Apprentice," contestants donate their winnings to charities -- more than $15 million overall to date, according to the network. "Donald made it clear that he wanted 'The Celebrity Apprentice' to be able to continue to raise millions of dollars annually for worthy causes, and now NBC and I have found an amazing new leader to do just that," executive producer Mark Burnett said. Schwarzenegger is one of the biggest stars in Hollywood history bringing in roughly $2 billion at the U.S. box office over a nearly 40 year career. The star's return in "Genisys" has made the Paramount film nearly $450 million worldwide since debuting over the Fourth of July weekend.